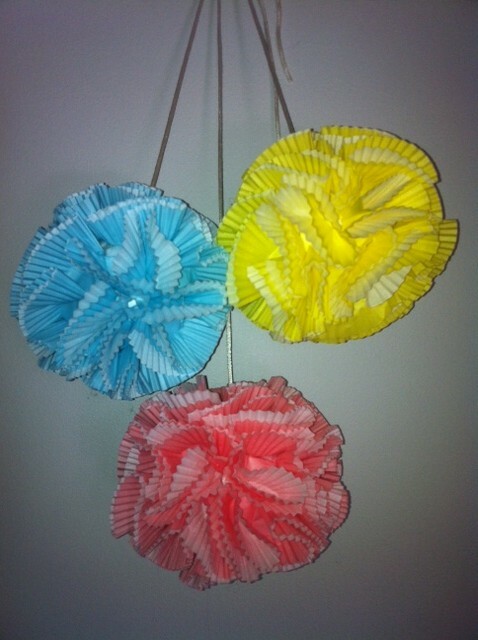 I found these cupcake liner pom poms on pintrest. It looked so easy that I decided to make them. All you need is cupcake liners, Styrofoam balls and a hot glue gun. Fold cupcake liner in half and in half again. Using the glue gun, glue the base of each cupcake liner to the Styrofoam ball. Place them close together so you can’t see the ball. This creates a nice full effect. Continue gluing liners on the ball until it is completely covered. Too easy! To display them you can sit the pop poms on a candle stick and use as a table centre piece. Or glue a piece of string and hang them from the ceiling. I used them at the end of my birthday banner. Paper craft and decorations are so effective but can be light on the purse too.. This is such a great decorative and innovate idea for using cupcake cases.